Are you feeling especially aware of some kind of relationship-related psychological wound that simply feels like it will never — and can never — heal? Take heart; for one thing, that sensation of “won’t ever heal” is an illusion. If you’re aware of it, you can heal it — though it might take time and effort. Today’s Birthdays: Calvin Fairbank (1816-1898), Walker Evans (1903-1975), Lois Mailou Jones (1905-1998), Oodgeroo Noonuccal (1920-1993), Lois Smith (1930), John Barry (1933-2011), Amartya Sen (1933), Sonny Rhodes (1940), Lulu (1948), Roseanne Barr (1952), Kate Capshaw (1953), Gary Ross (1956), Hal Hartley (1959), Davis Guggenheim (1963), Sticky Fingaz (1973), Gemma Ward (1987). News got out last Friday night that the Special Counsel’s office would be making arrests Monday morning in the matter of the Trump campaign’s collaboration with the Kremlin to interfere with the 2016 U.S. presidential election. When we learned Monday morning that Paul Manafort, the former campaign chairman, and his deputy Rick Gates, had turned themselves in to the federal district court, I knew that was the start of something big. After enduring Donald Trump’s antics for two years, his lies and brazenly criminal conduct and, worst, his obnoxious and swaggering narcissism, finally something had actually happened in response. Two top campaign officials were charged with a long list of financial crimes and conspiracy, most of which involved relationships to Russia and Ukraine. 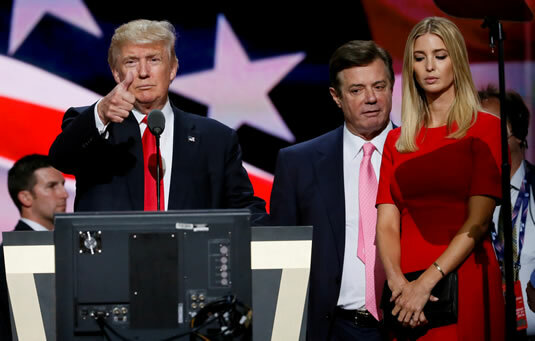 Republican presidential nominee Donald Trump gives a thumbs up as his campaign manager Paul Manafort and daughter Ivanka look on during Trump’s walk-through at the Republican National Convention in Cleveland, in July, 2016. Photo by Rick Wilking. While Trump was busy tweeting that Manafort’s and Gates’ 12-count indictments did not directly involve the campaign, news broke that a third defendant, George Papadopoulos, age 30, who was a “foreign policy advisor” during the campaign, had already entered a guilty plea and had been cooperating with prosecutors since July. That was the more interesting news: that the efforts of Robert Mueller III, the Special Counsel, had already flipped a key witness and obtained a conviction. 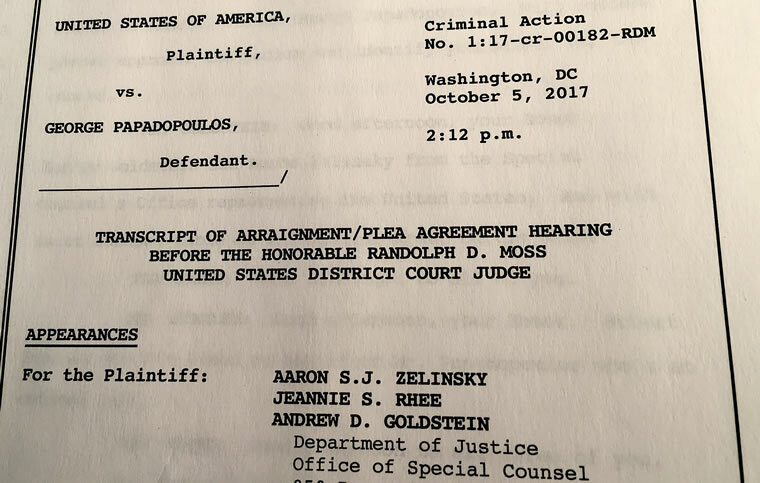 In what must have been the most stealth arrest in history, FBI agents working for Mueller’s office picked up Papadopoulos at Dulles International Airport on July 27 and made him an offer he couldn’t refuse. As a young man of 30, he had nothing to lose and only to gain by working with prosecutors. He pleaded guilty to one count of lying to an FBI agent (which happened just a week after the inauguration), with no jail time recommended. He earned that privilege. Moon Phase: Moon is in Waxing Gibbous phase and enters Full phase tonight at 10:23 pm PDT / 1:23 am Nov. 4 EDT (05:22:49 UTC). Next New Moon in Scorpio is on Nov. 18 at 3:42 am PST / 6:42 am EST (11:42:03 UTC). Moon Sign: Moon is in Aries and enters Taurus today at 2:46 am PDT / 5:46 am EDT (09:46:02 UTC). Moon enters Taurus at 2:46 am PDT / 5:46 am EDT (09:46:02 UTC). — Mars conjunct Elatus at 9:15 pm Nov. 2 PDT / 12:15 am EDT (04:15:30 UTC). — Venus conjunct Haumea at 9:22 pm Nov. 2 PDT / 12:22 am EDT (04:22:37 UTC). — Mercury opposite Sedna at 1:08 am PDT / 4:08 am EDT (08:08:17 UTC). — Venus sextile Saturn at 1:31 am PDT / 4:31 am EDT (08:31:24 UTC). — Sun trine Neptune at 12:22 pm PDT / 3:22 pm EDT (19:22:35 UTC). — Venus conjunct Psyche at 1:31 pm PDT / 4:31 pm EDT (20:31:23 UTC). People will inspire you, motivate you, and surprise you this year. But don’t let them drive you crazy. You must set limits on what you’re willing to exchange with people, and how much you’ll tolerate. That will call for setting boundaries, which will include time, space, money and energy. You have earned your happiness; you really should keep it. Are you feeling especially aware of some kind of relationship-related psychological wound that simply feels like it will never — and can never — heal? Take heart; for one thing, that sensation of “won’t ever heal” is an illusion. If you’re aware of it, you can heal it — though it might take time and effort, or the right timing, tools and assistance. Today, this situation is described by Venus in Libra conjunct the asteroid Psyche. The assistance is represented by the sextile they are making to Saturn, which is conjunct the Galactic Core in Sagittarius. While Saturn brings in the level of practical reality you must work with, and also offers a structure within which to work, the Galactic Core is beaming in some cosmic-level vibes. You are the beloved; not because of what you do or who you are, but simply because you are. Remind yourself as often as you need to.